There aren’t a lot of TV shows that Paul and I agree on. Probably because there aren’t a lot of TV shows I agree on period. But one show we both adore is The Americans on FX. From the first crazy-fast-paced episode we’ve been hooked. Set in the time of Ronald Reagan as president and at the height of the Cold War, The Americans tells the story about two Russian KGB spies living in surburban Washington D.C. with their family. Is it a real family? A real marriage? You have to watch to find out. We binge watched – and by binge watched I mean, we were at risk of deep vein thrombosis from sitting/lying on the sofa for so long – series 1, 2 and 3 on Amazon Prime and I’ve been literally counting down the days until the start of series 4. I may have actually written “10pm! The Americans!” in my diary. Because I’m a bit sad like that sometimes. So what to eat for dinner on such a night? I figured бефстроганов would be an appropriate Russian kind of food. That’s beef stroganoff to you and I. The first mention of “Beef a la Stronganov” was in a 1871 edition of a Russian cookbook “A Gift To Young Housewives” and involves beef, mustard and a little sour cream. 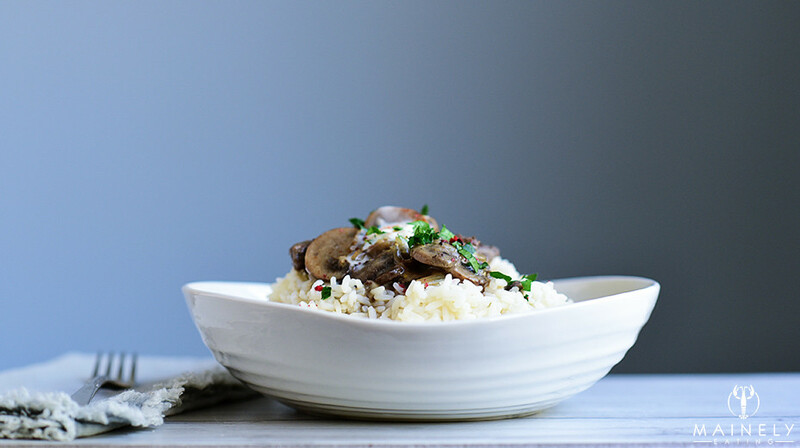 Over the years, the recipe has evolved to include onions and mushrooms. 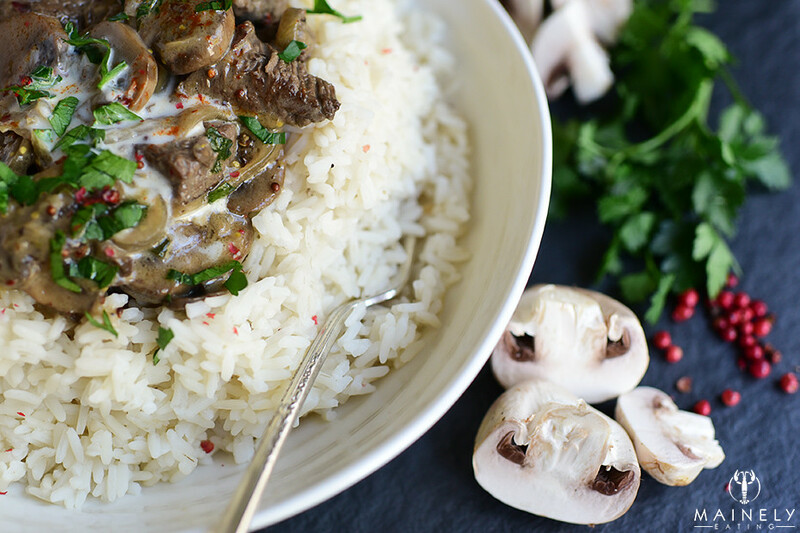 A stroganoff is usually made with a cheaper cut of beef simmered until tender but I wanted a quicker cook time so came up with this version involving filet mignon. Yes, filet is a more expensive cut of meat but you can easily stretch one small filet between two people with this recipe. The quandary was that starting the recipe by searing the filet meant it was inevitably a little tough and chewy by the time the mushrooms and onions had cooked. So I tried searing the filet right at the end of the cooking process, just to the point of medium, and then finishing it off in the rich sauce. Perfect! The whole thing takes about 20 minutes from start to finish but tastes like you’ve been toiling over the stove for hours. 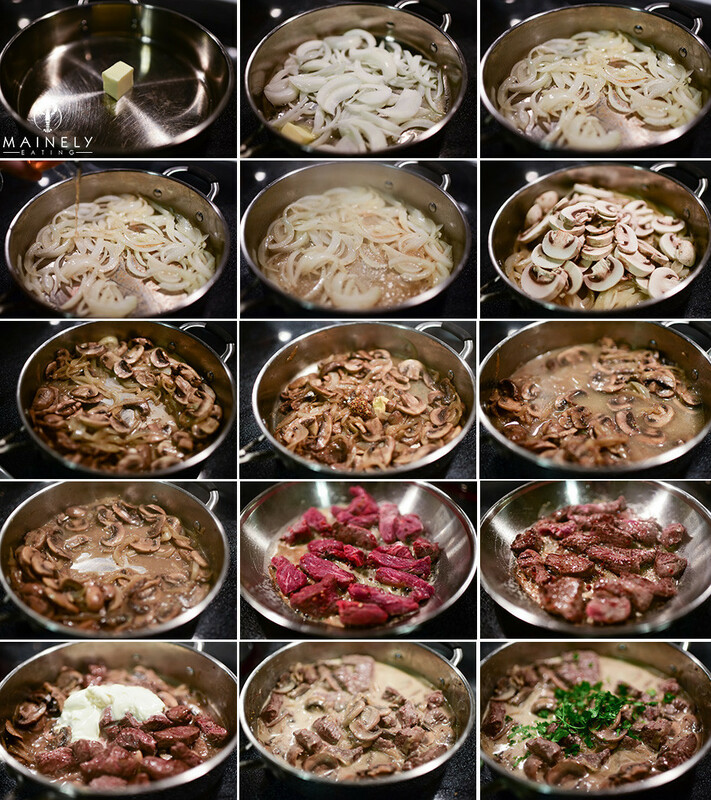 You’ll saute sliced onions in a little butter, add a healthy splash of brandy (skip this if you’re alcohol-free), add sliced mushrooms, stir in a little (or a lot) mustard, reduce down beef stock, add the seared filet, creme fraiche (or sour cream), and fresh parsley and serve over buttered noodles, rice or even mashed potatoes. To serve: your favorite cooked rice or buttered noodles. 3. Add sliced onions to pan, season and cook until just starting to brown, stirring frequently (~10 minutes). 4. While onions cook, prepare the mushrooms. Brush away any dirt, trim woody stems and cut mushrooms into generous slices. 5. Turn heat up high, wait for 30 seconds for pan to get really hot and then add brandy. Everything will sizzle up and the alcohol in the brandy will cook off. 6. Add the mushrooms to the onions. If the pan looks too dry, add another 1 tbsp butter. Cook until the mushrooms are soft (~10 minutes). Add the mustard and stir into the mushrooms. 7. Add beef stock and cook until the liquid has reduced by half (if you drag a spoon across the pan you should see a clear line before the thickened stock covers the line). Lower the heat to the lowest setting and prepare the beef. 8. Slice the filet into thick strips and crush the peppercorns. Press the filet into the crushed peppercorns and add a sprinkle of salt (preferably Maldon sea salt) and the flour. 9. Heat the remaining 1 tbsp butter and a splash of olive oil in a frying pan and taking care not to crowd the pan, quickly cook the filet strips until just about medium (about 2 minutes on either side worked for me, you want to cook it to just medium with a little pink in the center so it stays tender). 10. Add the seared filet and creme fraiche to the mushroom/onion pan and stir through. Cook for another minute or so until filet is still tender and sauce is hot throughout. Sprinkle over chopped parsley, add a good squeeze of lemon juice (the acidity will really brighten up the sauce) and serve. 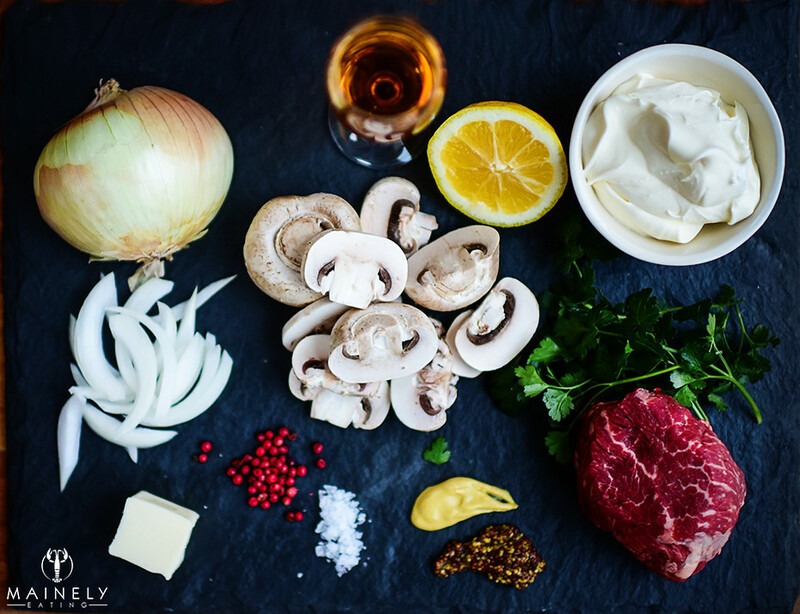 This entry was posted in Dinner, Entrees and tagged Beef Stroganoff Recipe, Beef Stroganov by Mainely Eating. Bookmark the permalink.